(Nanowerk News) DTU Nanotech is the Department of Micro- and Nanotechnology at the Technical University of Denmark. Within the field of micro- and nanotechnology, DTU Nanotech is committed to educating scientists and engineers, conducting research on an internationally competitive level, and transferring new technologies to Danish industry through joint programs. The Annual Report marks yet another successful year for DTU Nanotech. We have seen an increase in research funding, an increase in the number of citations of our papers, and an increase in the number of students. Moreover, an increased focus on innovation has led to 14 filed inventions, and more importantly an increased number of collaborative projects with industry. 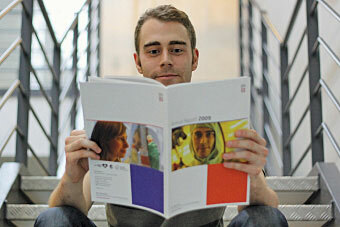 DTU Nanotech's Annual Report for 2009 is now available. The report has a special focus on our three strategic research areas at DTU Nanotech uniting research from six research sections, each contributing with their own unique competence. This edition also includes an overview of all Ph.D. projects carried out at DTU Nanotech, which bear witness to the broad spectrum of research going on at DTU Nanotech.